High performance four-channel amplifier and signal conditioner in one quiet package. 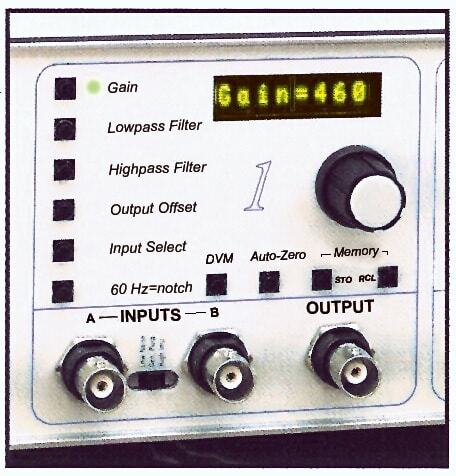 In addition to the Model 410’s features, the Model 440 offers an 8-pole Bessel lowpass filter, Auto-Zeroing, a line-notch filter, highpass filter, multiple memories per channel, and a digital voltmeter on 2 channels. A wide bandwidth of over 500 kHz at all gains insures smooth recordings. The Brownlee Precision Model 440 incorporates four channels of sophisticated amplifier and filter circuitry in a friendly easy-to-use instrument. Each channel consists of a high gain/low noise amplifier, an 8-pole Bessel lowpass filter, a highpass filter, a line notch filter, and output offset controls. A control knob sets the amplifier parameters and the values are displayed on a bright LED alphanumeric readout. The Model 440 adds controls for a high pass filter, notch filter, digital volt meter, auto zero, and input impedance on each channel.